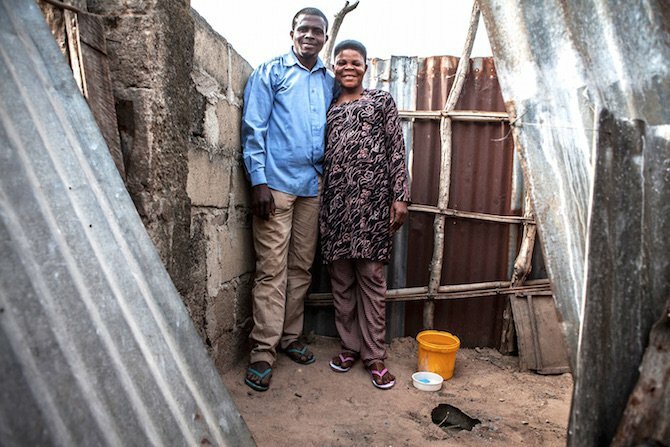 How one man is improving sanitation in Nigeria, one toilet at a time. Benedict Emori (right) with Chief Eni Idum from Iboni community. Due to his old age and poor health, Chief Idum was helped by Benedict to build his toilet. Benedict Emori is a community-led total sanitation (CLTS) champion from Abi Local Government Area (LGA), located in Nigeria’s south-eastern Cross River State. He is participating in the Rural Sanitation and Hygiene Promotion in Nigeria (RUSHPIN) programme, implemented by Concern Universal and funded by the Global Sanitation Fund (GSF) and the Nigerian government. Since 2012, several communities, including Benedict’s, have been embroiled in intermittent land disputes. While these small clashes pale in comparison to the Boko Haram insurgency in Nigeria’s northeast, the conflict in Abi has caused significant local displacements, resettlements, and a perpetual climate of insecurity. Improving sanitation coverage and hygiene practices through CLTS is especially urgent for populations affected by conflict, which are often the most vulnerable to outbreaks of deadly diseases such as diarrhoea, dysentery and cholera. However, conducting CLTS in insecure environments poses numerous challenges, such as accessing conflict affected communities and ensuring staff security. Even if these communities can be engaged, the CLTS facilitation process is often done under a climate of considerable tension, thereby weakening community-wide action towards ending open defecation. Also, as communities shift their priorities towards security issues, female headed households, the elderly, and people living with disabilities and HIV/AIDs are often those left without the support needed to build basic latrines. Throughout the RUSHPIN programme, the CLTS process has facilitated the emergence of community support systems, usually involving youth groups, which construct simple toilets for disadvantaged people. When conflict affected communities in Abi were visited by RUSHPIN facilitators, however, youths in the community complained that security, rather than building toilets, was their priority. As Benedict explains, “When we started this work, the initial response was slow. This was primarily because the young men did not buy into it. Many of them were not even at the ‘triggering’ event as they were on guard in the bush as vigilantes.” As a result, open defecation continued, especially for disadvantaged people who lacked the physical and economic means to construct their own latrines. Benedict leads a six person ‘CLTS consultancy’ team from ODF communities that support over 40 other natural leaders from 21 communities, most of whom have been affected by rising insecurity. The team is widely recognized throughout these communities where they sensitize communities on improving sanitation and hygiene, facilitate meetings with traditional leaders and youth groups to close their open defecation areas, and provide practical advice on using locally available materials for simple latrines and handwashing stations. Benedict also says that he uses his own community’s experience to encourage his neighbours. Since then, Emikwor has become a ‘CLTS pilgrimage’ for those who want to learn about achieving ODF status in their own communities. Benedict with Alice Elemi, a widow from the community of Idah. 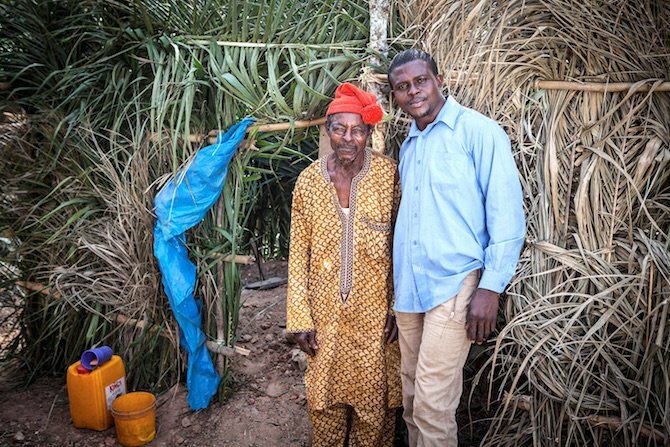 Since Alice’s children moved away, Benedict stepped in to build a private latrine outside her house. This article was written by Jonathan Ekhator and Patrick England in support of WSSCC.